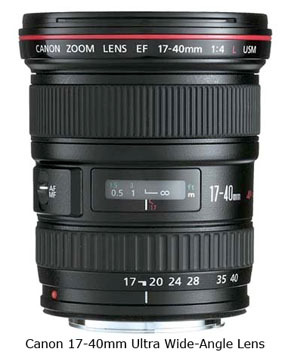 The Canon 17-40 Wide-angle Zoom Lens is one of Canon's best all time selling lenses. Does that mean it's a good choice for you? This post will give you some ideas if it's worth the money for you to consider. 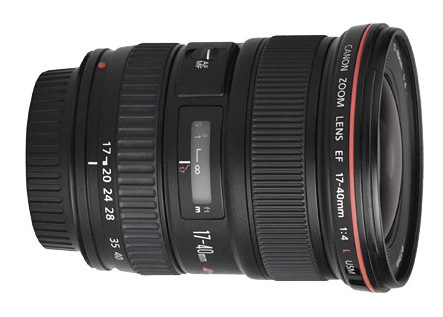 The 17-40mm f4 is the most affordable of Canon's wide angle zoom lenses. The 16-35mm f2.8 and the 20-35mm f2.8 are both faster, but they're more expensive. This Canon lens has the full-time manual focus. It has the USM (UltraSonic Motor)for fast and quiet focusing. It is actually considered an Ultra-wide lens when used with a full-frame DSLR. The maximum aperture is f4 throughout the zoom range.It has the common 77mm size for filters as well as a holder in the rear of the lens for filters. Just like other Canon "L" lenses it has the weather-resistant features built into the lens as well. It is easy to handle. It only ways a tad over 1 lb. At the widest setting of 17mm the angle of view is 104 degrees. That's pretty wide. At the minimum aperture of f22, your depth of field is extremely deep. Excellent for outdoor landscape photography as well as indoors when you are trying to photograph a lot of people in a small room. As with many super-wide zooms, there will be some light fall-off in the corners at wide open aperture settings. Some barrel distorsion in 17-20mm range. This is easily fixed now though with Canon's software. I use Adobe Photoshop. The lens hood is bulky, but it has to be so that you don't get vignetting. You can use this as a " standard" zoom lens is you have an APS-C format Canon camera. For me, no. Can you use the Canon EF 17-40mm lens for portraits? Yes, but really only for large group portraits or for strong perspective portraits where you want size distortion of your subject on purpose. Portraits are more flattering if a more distant, flatter view of your subject is used. Longer mid-length telephoto lenses are more typically thought of as good for doing portrait photography. The 17-40 is more typically used for shooting landscapes, seascapes. nighttime photos of the skies and photographing interiors where the spaces are tight. Super wide-angle lenses are really not a good choice for macro photography and the 17-40 lens is no exception, so evaluations of this lens as a good macro lens are pointless. For full-sized sensors, this isn't the Best Canon Portrait Lens to photograph individuals unless you are looking for "strong perspective" poses. Optional accessory is the Soft Case LP1319. 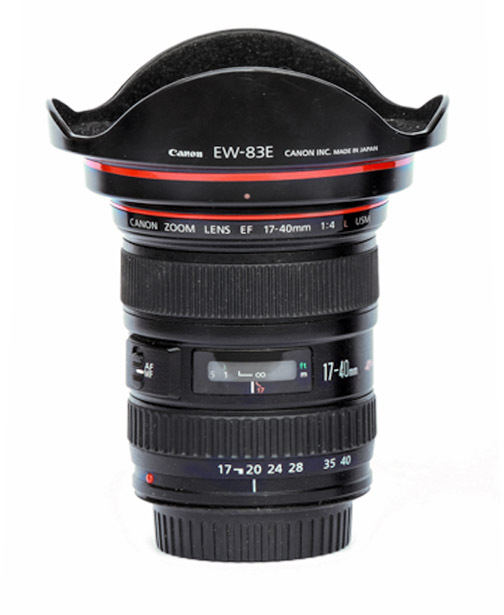 There are alternative wide-angle lenses for you if you're not a Canon loyalist. At about 1/3 of the cost of the Canon lens is an alternative lens for your Canon DSLR made by Tamron. I purchased this ones and have been quite happy with it. You can read reviews by quite a few photographers who have purchased it on Amazon below. Watch less TV. Shoot more photos.